On this day 25 years ago, in 1987, a group of autoworkers came together on the lawn of General Motors’ soon-to-be-closed Buick-Oldsmobile-Cadillac assembly plant to raise their voices against the closing – and to celebrate the 50th anniversary of the Great Flint Sit-Down Strike, which had begun at that very factory. 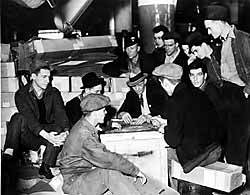 That strike, in 1936-37, was actually an occupation. 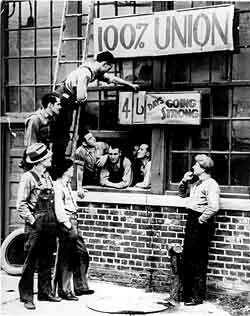 Hundreds of workers took over the factories in Flint and refused to leave for 44 days, until GM capitulated and recognized their union. 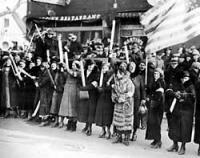 The strike inspired thousands of other workers across the country to stage their own occupations and, before you knew it, in the years to follow, factory workers were paid a living wage, with benefits, vacations, and a safe working place. The middle class and the American Dream were born 75 years ago today, on February 11, 1937, the day the Flint workers won their struggle. And for the next 44 years, working people everywhere got to own their own homes, send their kids to college and never worry about going broke if they got sick. That belief, that life would be good if you were a good citizen and a hard worker, now seems out of reach for nearly half the country which is either living in or near poverty. Perhaps people wouldn't mind it as much if the burden were being evenly shared. But everyone knows that's not the case. In a time of record personal bankruptcies, record home foreclosures, record family and student debt, there are a group of people having the best years of wealth and profit ever recorded in human history. And it is those very people who have made the decisions to export our jobs, to decimate unions, to make college unaffordable, to start wars and to pay themselves with gluttonous joy while paying little or no tax – this is the 1% that has created the burden so many Americans (and people around the world) now share. And so, 75 years after the victory in Flint, the battle is now being fought all over again. But this time it's not just about getting paid a dollar an hour, or having Sunday off, or reducing the chance of your hand being crushed in the metal stamping machine. This time, the stakes are even greater: Who is going to own America and control the basic functions of our democracy -- the richest 1% who buy the politicians to get what they want, or the 99% who don't have much these days and live in anxiety or fear of what's around the bend. I believe that justice will win out again, in the end, just as it did 75 years ago today in Flint in 1937.